A while ago I wrote about Personal Kanban at Snapper. Personal Kanban, or KanbanFor1 as we call it, has supported Snapper’s Agile adoption and has proven an excellent training ground for the team to develop good habits and behaviours. As in all Agile adoptions the delivery team aren’t the only ones affected by the change and in this post I describe how I have used personal Kanban as a co-coaching tool to help a Product Owner adapt to the challenges of his new job. Nick was Snapper’s first Product Owner. He immediately caught on to Agile ideas and principles, and the fundamentals of team work, collaboration, daily co-ordination, commitment and shared responsibility were right up his alley. He loved Scrum and sprints but with all his enthusiasm he had trouble being the Product Owner rather than a team member. His enthusiasm and great technical skill led him to interfere with the team’s work while the product backlog suffered from a lack of direction and attention. In short, he wasn’t doing his job because he was doing someone else’s. I knew we had to find a way to make him realise what his job actually was, that the team depended on him and that this was a fun and fully Agile role. First of all, we had to get to the core of the issue and find the root cause for why he wanted to interfere with the team’s work. After a number of coaching conversations we figured out that he felt like he was missing out. He felt excluded from the team’s experience of “being in it together”, learning together, and succeeding and failing together as a team. It was through Nick that I realised that introducing Agile into an organisation can be great fun for the delivery team but that people who aren’t part of the core team often feel like they’re missing out on the fun and excitement. Agile teams get to feel the team spirit and have the opportunity of learning together while supporting each other in the process. Also, if they start out with Scrum delivery teams have the advantage of clarity through following a number of simple, scripted steps and pre-defined meetings in the beginning. People around them, such as Product Owners, line managers, CIO, CTOs and other “related” stakeholders are less immersed in the team. So, Nick and I agreed to experiment with personal Kanban and its Lean-Agile principles, structure, and visibility. We organised a KanbanFor1 board for him and after each team sprint planning we’d have a look at Nick’s next personal sprint. We’d go through his week and would add Product Owner tasks such as writing user stories, grooming the backlog, forecast feature delivery, track budget and so on to his backlog. We’d make sure to leave slack for stuff that came up during the week and things that weren’t necessarily directly related to the team such as following up on a vendor contract, liaising with marketing or doing user research. During the week we’d catch-up on these tasks and I’d help and support him through coaching. At the end of each week we’d take status, do a retrospective and discuss where Nick wanted to focus next. The experiment was a great success and personal Kanban worked well for us. It proved to be an excellent learning and coaching tool. It is relevant to note though that this worked because Nick and I trusted each other and had a very clear agreement. From a coaching perspective personal Kanban has worked very well for me as a coach and for people who aren’t directly part of a Scrum team. Product Owner and other management roles are usually a lot less well defined and more fluid than the role of a team member and there’s usually no team board with tasks to provide visibility. I found Personal Kanban extremely valuable in providing this visibility and it has helped me to tailor continuous coaching processes and conversations. It is important to note that before using personal Kanban as a coaching tool it is necessary to have a coaching agreement in place. I’d never force this on a coachee and I always back off if people aren’t comfortable with the visibility. In general I have found personal Kanban has supported the adoption of Agile on an organisational level through better coaching opportunities, increased visibility and shared understanding. 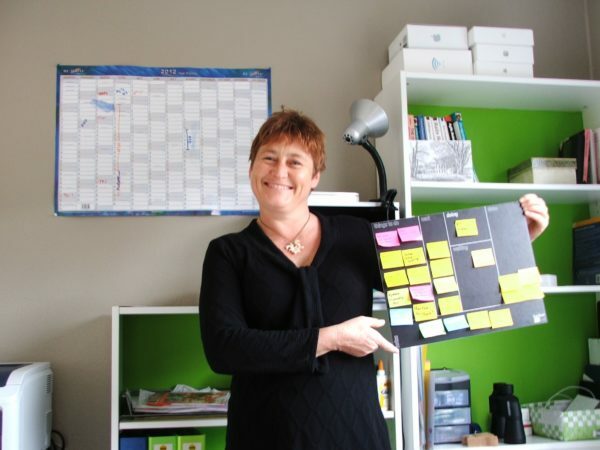 I have since also used personal Kanban as a supporting tool for coaching Scrum Masters, line managers, CTOs and Product Owners. I’d love to hear if any of you have had experiences with using personal Kanban as a coaching tool. Whether it’s as a coach or a coachee it’d be great if you would share your experiences. 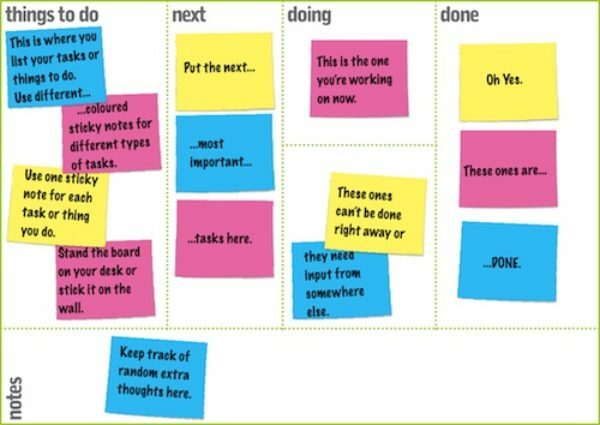 If you’d like to try this out and want buy your own designer KanbanFor1 board you can get one here at KanbanFor1. Categories: Coaching, Product Development, Personal Productivity. Tags: Agile coaching, Kanban, Kanban boards, Kanbanfor1, Personal Kanban, product owner.